Known worldwide for its Fashion and Design Weeks, Milan is a high-end international tourist destination with an unequalled mix of landscapes and food and beverages offered by its surrounding areas, and unique cultural events scheduled to mark the 500th anniversary of Leonardo da Vinci’s death. Beautiful vistas of Lake Como and exciting truffle hunting in the gastronomic Alba are great examples of interesting tourism activities within easy reach of Italy’s northern city. 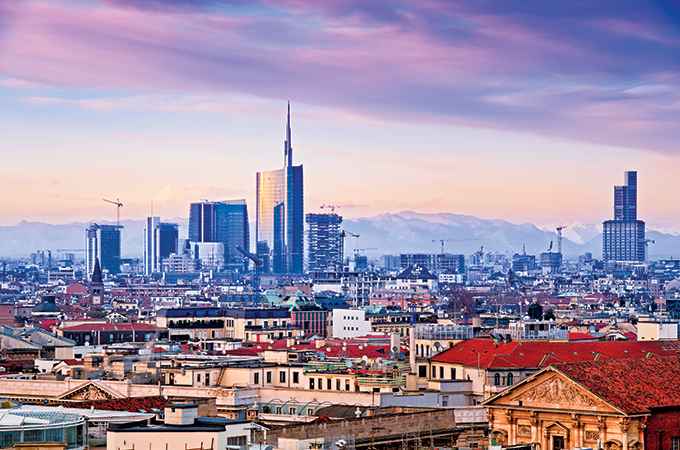 Milan is a city of contrasts, where historic buildings are flanked by an avant-garde skyline. In two thousand years of history, the city has been transformed while staying true to its DNA in a way few other cities in the world have managed. From Mediolanum, capital of the Roman Empire, to medieval Free Comune, from the opulence of the courts of the Visconti and the Sforza to the traders on the Navigli. Today, its palazzi still preserve the inheritance of Spanish, French and Austrian rule, well integrated with examples of art nouveau, art deco and 20th century architecture and with more recent works by noted architects that have transformed and upgraded entire neighbourhoods. A dynamic city, with Expo 2015 it has continued the transformation which has further modified its skyline and appearance. Despite being cosmopolitan with a Nordic cut, it is warm city where people maintain a capacity for hospitality and humanity typical of Mediterranean countries. MonteNapoleone District, together with Milan City Council and some of the most prestigious five-star hotels in Milan and Como, organised the second Unexpected Milan event in Cannes during ILTM 2018. Some of the key hotel partners at the event were: Armani Hotel Milano, Baglioni Hotel Carlton, Bulgari Hotel Milano, Excelsior Hotel Gallia, Four Seasons Hotel Milano, Grand Hotel et de Milan, Mandarin Oriental Milan, Park Hyatt Milano, Hotel Principe di Savoia, and The Westin Palace Milan as MonteNapoleone District partners, while Il Sereno, Mandarin Oriental Lago di Como and Villa d’Este hotels joined from Lake Como. According to Cushman & Wakefield’s annual report, MonteNapoleone is the fifth highest ranking street in the world based on revenue per square metre with a foot traffic of 25,000 target customers per day. The Milanese fashion and luxury district, where over three billion euros are spent every year in the boutiques, represents 25 per cent of the market share in the Lombardy Region and 12 per cent of the GDP in Milan. Starting from May 2019, the nine months celebrating Leonardo da Vinci will provide a new and precious opportunity for Milan to strengthen its calling as a tourist city. Visiting Milan will not only mean breathing the same air and hanging around the same places where Leonardo lived his daily life 500 years ago, but it will mean experimenting the same creative excitement, innovation and transformation, still at a fast pace, changing the urban fabric and making Milan a state-of-the-art city at the global level. In addition to landmarks such as the Duomo and La Scala Theatre, there are also outstanding works by contemporary artists and prestigious cultural events. It is a city whose beauty is hidden in noble gardens, cloisters and the courtyards of case di ringhiera (popular housing built around a central courtyard) and in secret little corners. “Milan witnessed 6.2 million arrivals and 12.5 million visitors within the city’s administrative limits alone in 2017, and with a predicted increase of almost 8 per cent in 2018,” says the deputy mayor."